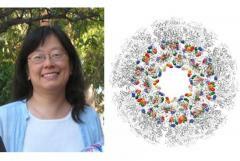 Associate Professor Szu-Wen Wang, Ph.D., Department of Chemical Engineering and Materials Science in The Henry Samueli School of Engineering, has had her research on biomaterials published in the journal Advanced Functional Materials and featured in Materials View. Biomaterials made from natural units, such as self-assembling biological complexes, have a variety of applications in materials science and nanotechnology. The functionality of protein-based materials, however, is frequently limited by the absence of specific chemical conjugation sites. Wang teamed with graduate students Dongmei Ren, Mercè Dalmau Mallorquí, and Matthew M. Shindel; Assistant Project Scientist Arlo Randall, Ph.D.; and Chancellor's Professor Pierre F. Baldi, Ph.D., to develop a new strategy for loading organic molecules into the hollow cavity of a protein nanoparticle that relies only on non-covalent interactions. The design mimicked molecular principles used by naturally occurring drug transporters. Its applicability in drug delivery was demonstrated when the drug-loaded protein nanoparticles were taken up by breast cancer cells, with a subsequent intracellular drug release killing the cancer cells. This strategy of engineering non-native hydrophobicity is a novel approach that could be broadly utilized for attaching guest molecules to other protein-based materials for molecular transport and applicability in bionanotechnology. Wang received a B.S. degree in chemical engineering from the University of Illinois at Urbana-Champaign in 1993, a M.S. degree in chemical engineering from Stanford University in 1994 and a Ph.D. degree in chemical engineering from Stanford University in 1999. She then worked as a scientist at The Liposome Company until 2000 when she became a senior scientist at TransForm Pharmaceuticals. Wang joined the faculty at the Samueli School in 2004.